Greater personalisation has become the holy grail for content marketing publishers across both B2C and B2B. Endless research has proven that greater personalisation brings greater engagement – which leads to more conversions and an increase in sales. This all makes sense, after all, the more relevant and useful content is, the more a potential buyer of your products or services will consume and interact with it. "Greater personalization typically increases service relevance and customer adoption, but paradoxically, it also may increase customers’ sense of vulnerability and lower adoption rates." Or in simpler terms, too much inappropriate personalisation freaks people out and they may stop dealing with you simply for being too creepy. 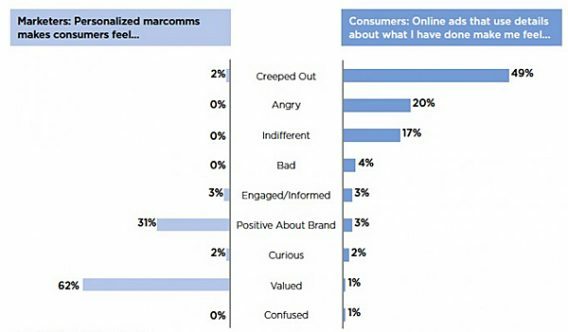 Furthermore, recent research by CEB has shown there is a huge gap between how marketers and consumers view personalisation: Only 2% of marketers thought that personalised marcomms makes people feel creeped out, whereas a whopping 49% of consumers said that’s how they feel. And again, 62% of marketers though that it makes customer’s feel valued, whereas the reality is that only 1% feel that way. Finally, no marketers thought that consumers would feel angry about personalisation, versus 20% of consumers who actually do. There is a huge disconnect and should make every marketer question the way they use personalisation. Now, yes these are US B2C figures, not UK B2B – but this is such a massive chasm – B2B marketers should also be mindful of their enthusiasm for personalisation. So what are the reasons for this paradox and how can you take advantage of the benefits of personalisation while avoiding the pitfalls? What are the rules? First, let’s understand what people are worried about, what are their concerns? Understanding them is the key to delivering personalisation without issues. Privacy issues and the value of data are increasingly becoming concern. This has resulted in a reduction in willingness to share data, with the majority of people reluctant to share more than their very basic information. Interestingly, studies show that the number one factor that would influence people to share more information is being given the ability to delete it if they should so choose. Back in 2013 the Pew Research Center looked at attitudes towards privacy in the US and found that 50% of Internet users were concerned about the amount of information about them that is available online – in 2009 that figure was 33%. They also found that 86% of internet users have taken steps online to remove or mask their digital footprints— such as clearing cookies, encrypting their email, avoiding using their real name and using virtual networks to mask their internet protocol (IP) address. In B2B it should be slightly easier as marketers are potentially less interested in personal details than more impersonal company and commercial details – information which is often publicly available and in which buyers do not have a personal vested interest. There is also a logical recognition that sharing this data may help find them a better matching solution. Consumers have little confidence that their data will be kept safe and secure – according to the findings of a government report, a staggering 83% of UK consumers are concerned about which businesses have access to their data and whether it’s safe. This is not going away – according to the ICO’s Annual Report, data protection concerns are up 15% in 2016 over 2015. This is not an unfounded concern, over the past few years, there have been a number of high-profile data breaches – some of them, like the HMRC’s loss of two CDs containing the data of 25 million child benefit claimants (every child in the country), massive in scope. And if a company like Sage, whose very business is based upon B2B financial data, can experience a security breach, then that doesn’t leave businesses feeling very safe either. 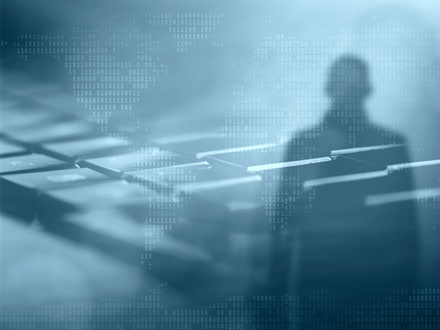 For B2B, keeping your customer’s data secure is vitally important – KPMG’s supply chain research found that 86% of procurement departments would consider removing a supplier from their roster if there was any form of a security breach at that company. This has two implications for B2B data capture; firstly, you have to ensure your prospects feel that their data is safe with you – not an easy task even for top brands – and secondly, you may find the information that buyers are willing to share is less than you would like. 93% of adults say that being in control of who can get information about them is important. 90% say that controlling what information is collected about them is important. This is an issue because people do not feel in control of their personal data – only 17% in a recent survey felt comfortable about the use of their data, and 72% were concerned about how their personal information is being used and collected. So what guidelines should we follow? Here are six ways we can approach personalisation and avoid you becoming that creepy stalker company. What data for what purpose? Given that we know that there is both a control and a trust issue, it’s important that when people are making the decision about whether to share information with you, you are crystal clear about what information you are collecting and what you intend to use it for. Tell people what they are likely to receive and how often, and that they can unsubscribe or delete their account at any time. It is not always about consent either, as most users don’t realise the full implications of granting consent and may well be shocked when you use that data to personalise a message to them. Let’s face it, many marketers don't realise what they can do with all the data they have – so the poor end user is very unlikely to realise all the implications. Which again is why it’s important to detail what they are going to receive and what the data is used for. According to a study by BloomReach (UK Consumer and Marketer Personalization Study) only one in ten people find a named greeting to be worthwhile. These can be viewed as gimmicky and insincere. It offers no value. What people really want is customisation that actually benefits them. So the big lesson here is that personalisation for personalisation’s sake is an instant fail. Only personalise if you can provide real value to your customer. This is important. It is not about providing value to you, or doing it because you think you should, it’s about providing better, more relevant content to them. Personalisation that helps to provide a better customer experience is also of value. In a global B2B survey conducted by Avanade, 56% of purchasing decision-makers within companies reported that they will (and do) pay more for products/services if the customer experience is better than with less expensive vendors. On average, they will pay 30% more for superior customer experience. If there is no value to the customer in your personalisation – don’t do it. According to Seth Fendley of ClearPivot: "Personalization is only creepy if you make it creepy. Only use personalization in areas where people expect it (after opting in, in emails, etc.). The goal of personalization is to make a lead or customer feel welcome. The moment they feel welcomed on your site you have succeeded with personalization." Personalisation feels creepy when it’s unexpected. Imagine a stranger coming up to you in the street and having a conversation with you about things you thought were private – how creepy would that be? Or if someone started stalking you in Facebook and then used information from there to start a conversation with you out of the blue, in a pub? Creepy right? When putting together your personalisation strategy, put yourself in your prospect’s shoes and try and imagine how it would feel if you followed the same process in the real world; if you called on your prospect at their home and started the conversation – would it be creepy? If they’re surprised that you know that information about them, it’s too much. Many companies in the creepy category seem to want to demonstrate how clever they are when marketing to their customers with messages such as “We see you haven’t flown in a while, so here are some cheap flight offers”. But, research shows that this approach creeps people out and is not as effective as making the offer without the demonstration of knowledge. There is a well-known case study where Target in the US built a marketing system to identify pregnant women and offer them deals on things they might need, like nappies and baby oil. However, this was not well received by the audience, so Target added into the marketing collateral other deals on lawn mowers or power tools, so the whole thing felt completely random. The strategy worked, and sales of baby related products increased. So the trick here is to make any content, offer or call to action seem natural – within its context. Never feel the need to demonstrate how much intel you have on your buyer or how clever your personalised marketing is. With current monitoring software, it’s possible – especially with business prospects – to monitor their blog posts, comments, photos and everything they said and did on LinkedIn, Twitter and Facebook. You can then use contact software to collate all this information and build up a complete profile alongside the data they have submitted to you. But be very careful when using this in personalisation as 80% of people are uncomfortable about personal data used alongside data they’ve sourced (Amazeone Fair Trade Guide). Offering content and offers based on personalisation that is not “in your face” personalised seems to be the best strategy. 94% of customers have discontinued communication with a company because of irrelevant messages. — Janrain & Blue Research. By far the biggest complaint against ALL marketing content is that it’s irrelevant. And when it comes to personalisation you are compounding the issues of personalisation if you end up getting it wrong. Not only will it waste your prospect’s time, but you will end up looking incompetent too, given that personalisation is supposed to ensure relevance! The information you have is not enough to base the action on. The conclusion you’ve drawn from the data is wrong. There are many ways in which data can be incorrect, from a simple spelling error to deliberate misinformation provide by the prospect. Way too much could be written on this subject alone, but just make sure data is robust before basing personalisation on it. Incomplete information is as bad as wrong information and equally problematic. If you don’t have the complete picture – don’t take any action. Stick to actions based on what you definitely know about a prospect – don’t try and second-guess. The last of the three is not the least of the issues – but you can at least review results and refine your conclusions over time. The rule here is don’t use personalisation unless you have a body of accurate data (with context), and you are sure you are taking the right actions based upon it. Otherwise, you will produce irrelevant content that will damage your standing with your prospect – doing more harm than good. Don’t forget there is one very easy way that you can almost perfectly personalise content to an individual without any knowledge of who they are, where they are at in the buyer’s journey and without any data collection or effort. And that will actually provide useful data about them going forward. Give the visitor choice – allow them to choose what content they want to look at. Content Marketers need to remember that the whole beauty of the web is that customers can take multiple routes through a web site, look at multiple items of content and choose what they want to look at and how long they look at it. Allowing easy to access content that covers multiple buyer scenarios means that the buyer can personalise their own content. What’s more, the trail that they leave you can measure and analyse (using tools like Google Analytics) to further understand their needs going forward. This does not, however, supersede you aiming to provide content that your strategy and buyer persona profiling suggests they should be interested in when they first visit the site – but it can act as an effective plan B if that doesn’t appeal or you simply get it wrong. Blocking off options is never a good idea. And most strategy assumes that a buyer (or buying department) is making one purchase at a time – but reality can be more complicated. You never know, a buyer might be looking at two different solutions in the same time frame and they could simultaneously be at two different stages in the buyer’s journey. Making sure your site is easy to navigate and offers options and choices is essential, non-creepy and should deliver the content the buyer is looking for. Remember that B2B is primarily account-based, which means that buyers are purchasing on behalf of an entire company. At the enterprise level, this process rarely involves one individual. So you may need to personalise your content to a group rather than a single buyer. Getting too personal in this situation simply won’t work. B2B buyers generally have different concerns, and personal aspects are less important. Buying decisions are based on rational business factors, rather than emotions (although some emotions, such as trust, still play a significant role). Many buying processes are open to scrutiny from peers or superiors – so communication that is too personal would be inappropriate and awkward. While you might want to expend time and valuable resources profiling every individual to the nth degree – is that really going to be helpful? Are you really going to use that data? Is it really going to be cost effective? Interestingly, this all points to too much deep personalisation being less effective in business marketing and to a slightly more generic view being the way forward. This is almost exactly what the buyer persona represents, and validates the approach of basing your personalisation of content on the buyer persona model. Read our blog on the importance of buyer personas to your B2B content marketing. Capturing just the information you are going to need – just the information you are going to actually use; makes personalisation more practical and more economic. Delivering to the buyer persona the right content, at the right time (i.e. appropriate to their stage of the buyer’s journey) will be the most effective personalisation strategy for B2B. Provide value – personalisation should be there to add value to your prospects and customers. If it doesn’t add value – don’t waste valuable time and resources doing it. Be expected – never surprise your prospects with what you know about them – that is creepy. Never make an overt display of your knowledge. Be relevant – use personalisation to be relevant to your target buyer with helpful content at the appropriate time. Offer options – never use personalisation to shut out options – always provide the ability for users to choose their own content and offers. Don’t get too personal – remember this is business. Use the buyer persona as a guide to your personalisation.